In North Korea (Democratic People's Republic of Korea), the climate is continental, with freezing, sunny winters and hot, rainy summers. The country is affected by the monsoon circulation: during winter, the cold northwest wind of Siberian origin prevails, while in summer, it is replaced by southern currents of tropical origin. This explains the precipitation regime of North Korea, which, for example, is opposite to that of the Mediterranean: the driest months are those of winter, while the highest amount of rainfall is recorded in July and August. The rains brought by the summer monsoon can sometimes be very abundant and cause flooding (as happened, for example, in August 2007 or in July 2012). In summer and early autumn, the country can be reached by typhoons. 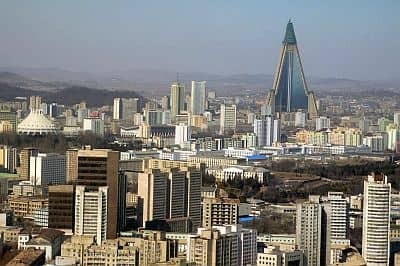 The capital, Pyongyang, is located on the western side, about forty kilometers (25 miles) away from the Yellow Sea coast. In winter, during cold spells, the temperature can drop below -20 °C (-4 °F); in January 2001, it dropped to -26.5 °C (-15.5 °F). Summer is sultry, with peaks of 34/35 °C (93/95 °F). Here are the average temperatures. In Pyongyang, precipitation averages 940 millimeters (37 inches) per year, so it's quite abundant, although it is concentrated from May to September; in winter, it is scarce, and given the temperatures, it occurs in the form of snow. Generally, North Korea is a sunny country. There are many sunny days even in winter, while in summer, the sunshine hours decrease a bit because the monsoon brings some periods of bad weather. Here are the average daily sunshine hours in Pyongyang. The sea in North Korea, very cold in winter, becomes warm enough for swimming in summer, especially in August, at least on the west side (Yellow Sea). Here are the sea temperatures near Nampo. On the east coast (Sea of Japan), the sea temperature in summer is 1-2 degrees Celsius lower, and reaches a maximum of 23 °C (73 °F) in August. In the northeast, the sea is even cooler, and it reaches only 21 °C (70 °F) in August. Along the coasts, the weather is a bit milder, in addition, at a given latitude, the east coast, on the Sea of Japan, is milder than the western coast, on the Yellow Sea. Here are the average temperatures of Wonsan, located on the east coast, at the same latitude as Pyongyang. In Wonsan, 1,250 mm (50 in) of rain fall per year; here, in particular, the month of September is still very rainy. Southeast of Wonsan, winter is even milder, so much so that in Kosong, at the foot of Mount Kumgang (see below), the average of January goes up to 0 °C (32 °F). On the contrary, on the north-eastern coast, near the border with Russia, the climate is colder, both because of the higher latitude and because of the presence of a cold sea current, called Liman current. Here are the average temperatures of Sonbong, located on the coast, near the border with Siberia and 150 km (90 mi) from Vladivostok. As you can see, spring is very cool, if not cold, and summer is not particularly warm. In the interior of North Korea, there are mountainous areas, where the climate gets even colder, and in winter, the temperature in the worst moments can plunge to -40 °C (-40 °F). The highest ranges are found in the northeast, and are the Rangrim mountains, whose highest peak is Wagalbong, 2,260 meters (7,415 ft) high, and the Hamgyong Mountains, which include several peaks over 2,000 meters (6,500 feet), the highest of which is Mount Kwanmo, 2,540 meters (8,333 feet) high. 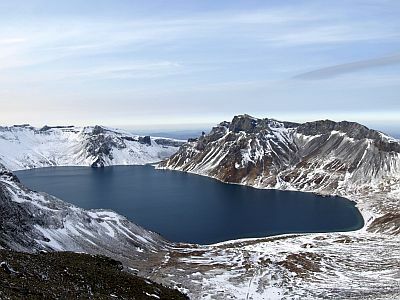 However, the highest peak of the country, and the sacred mountain for the Koreans, is Mount Paektu, also known as Baekdu or Baitou, which is located in the northeast, on the border with China, and it's 2,744 meters (9,003 ft) high. It is a volcano, and its center is occupied by a caldera lake, called "Heaven Lake", which was formed after the big eruption of 946 AD. Snow may cover the top until June. Here are the average temperatures of Samjiyon, situated at 1,350 meters (4,400 feet), at the foot of Mount Paektu. 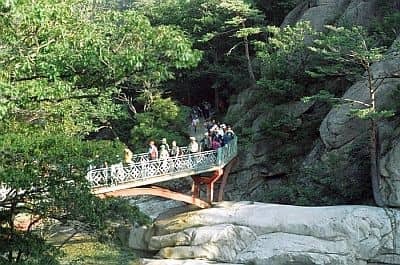 Another famous mountain is Mount Kumgang, 1,638 meters (5,374 ft) high, located in the south-east, a short distance from the border with South Korea, in the area having a milder climate, and where access is allowed to tourists from South Korea. Here, there is a landscape characterized by its rock formations. In winter, you can find frozen waterfalls. As mentioned, during the summer, the DPRK can be reached by typhoons, the tropical cyclones of East Asia. Typically, typhoons affect Korea from July to early October (and more rarely, also in the second half of June), with a higher probability in the first half of September. Since typhoons come from the south, they affect more directly South Korea, where they bring the strongest winds and the most intense sea storms; usually, in North Korea, they mostly bring heavy rainfall, which is added to that of the summer monsoon and can cause landslides and floods. Considering the winter cold as well as the heat and the rains of summer, the best times to visit North Korea are spring and autumn, in particular, the months of May and October, though in October, it may already get cold in the northern mountainous and inland areas (where June and September are preferable). In winter: bring very warm clothes, such as a down jacket, gloves, a scarf, and a hat. Especially for inland and mountainous areas, bring clothing for extreme cold, thermal underwear, a parka, a jacket in Gore-Tex, gloves, a hat, and a scarf. In summer: bring light clothing, a light sweatshirt, a light raincoat or umbrella, and a scarf for the wind. In the hills and in the northeast, a sweatshirt and a light jacket for the evening; in high mountains, a jacket and a sweater.